Twelve bodies have been recovered from a factory fire in eastern Moscow, Russia’s Emergencies Ministry says. Police are investigating to determine the causes of death and if arson was involved. Sources suggest the massive blaze may have been a cover-up. The fire broke out Saturday night in Moscow’s eastern Sokolniki district, which engulfed 3,000 square meters of a building on Stromynka Street. A sewing workshop was located at the epicenter of the fire, which was contained by 1am Sunday Moscow time (22 pm Saturday GMT). 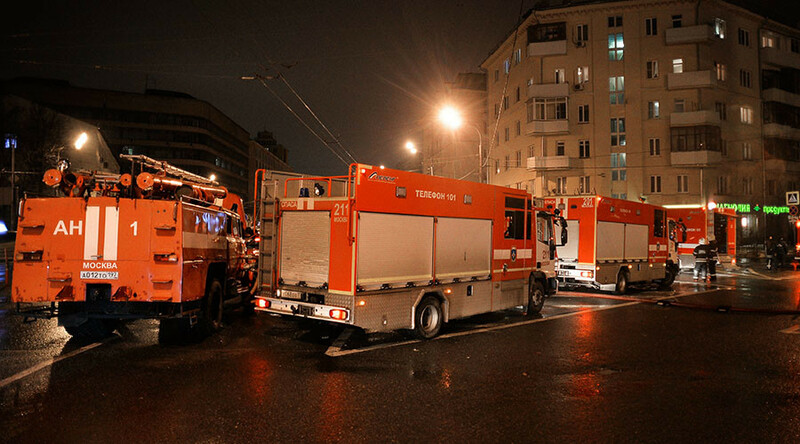 Emergency squads managed to prevent the fire from spreading to a fireworks warehouse located on the ground floor, as well as to nearby buildings, Emergency Ministry spokesperson Olga Zolotova said. Investigators have so far confirmed discovering the bodies of eight victims in the aftermath of the fire, which destroyed or damaged 3,000 square meters of a building on Stromynka Street in the city’s eastern Sokolniki district. A sewing shop was located at the epicenter of the fire. Three of the fire’s victims were children, and one of them was a baby, Pavel Astakhov, the presidential ombudsman for children's rights, wrote on Twitter. Во время пожара в швейном цеху на ул.Стромынка в Москве погибли 3 детей. Один из них грудной младенец. Investigators have confirmed the discovery of 12 bodies in the aftermath of the fire. A criminal case was launched under the “deliberate destruction or damage to property entailing human death and other grave consequences” article of the Russian Criminal Code, Investigative Committee spokesman Yulia Ivanova told reporters. Earlier, investigators had said they launched a case seeking murder charges. Meanwhile, a law enforcement source told TASS that the nine victims were all of “non-Slavic appearance.” The identities of the dead are still unknown at this point, but are being established. According to preliminary data, the victims were working migrants, living in the factory, the Astakhov wrote. The deceased originated from Central Asia, media say. По предварительным данным на месте работы проживали мигранты.Некоторые были даже с детьми.Возбуждено уг.дело.Рассматривается версия поджога. Several sources of fire have been found at the site, leading the investigators to suspect the building might have been set on fire deliberately to conceal a crime, a police source told TASS. He added that it was not immediately clear if the deaths were caused by the fire or by criminal actions prior to it. This is now being determined by forensic experts.